Not all default fields are available in the Project Server Reporting database, for example the Contact and Resume fields. To be able to easily include these fields in reports using direct T-SQL you will need to get the values for these fields in the Project Server Reporting database. The easiest was to achieve this is to create a new custom field that uses a formula and reference the default field. The new custom field will then be available in the reporting database. Below is walkthrough guide using the Contact field to show you what I mean. Now I need to open and publish the project/s so that the TaskContact custom field pulls in the values from the default Contact field and synchronises these values to the Reporting database when published. 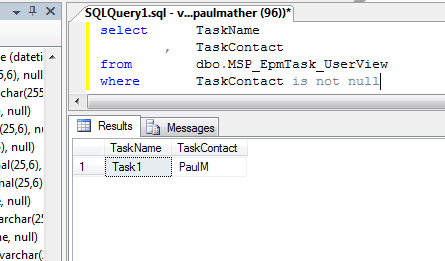 You can see below that the Contact PaulM is now available in the MSP_EPMTask_UserView for Task1.